There were some hefty challenges, from both sides, right from the beginning of the match. The Kashiwa players were trying to create some good openings, and Paris Saint-Germain was really good at defense. The Paris Saint-Germain players were not really testing Leo Kokubo too much in the first half. It was starting to look fairly even, 16 minutes into the clock. Inside the final ten minutes into the first half, it was nil-nil; but they still had their chances. The first half never really came to life for either of the teams. The opening goal of the game came from Kapo, for Paris Saint-Germain, 54 minutes into the clock; it was some great display of tackling skills inside the box. PSG was always looking to create opportunities to bring more goals in the second half, and the Kashiwa players were mostly playing it out from the back. Kashiwa’s opening goal came in when Tomita, the central defender, took benefit of a corner kick, and delivered directly into the box. The whole match was an intriguing battle, and nothing could split the two teams. There was a wall of defenders on the pitch tonight – the blue shirts were lined up to defend anything that the Japanese players were creating. It was looking like a powerful play on the far side for Paris Saint-Germain, and they were using some combination styles of passing the ball. It was a great save by Hosoya, with a little bit of help from Takeda, 30 minutes into the game. It was one of the best chances of the game for Paris Saint-Germain. Soon, Kokubo made a similar save for his team. Both goalkeepers were busy in the last couple of minutes of the first half. PSG was slowly opening up a bit more on midfield, by the end of the first half. Kashiwa made four changes at halftime. 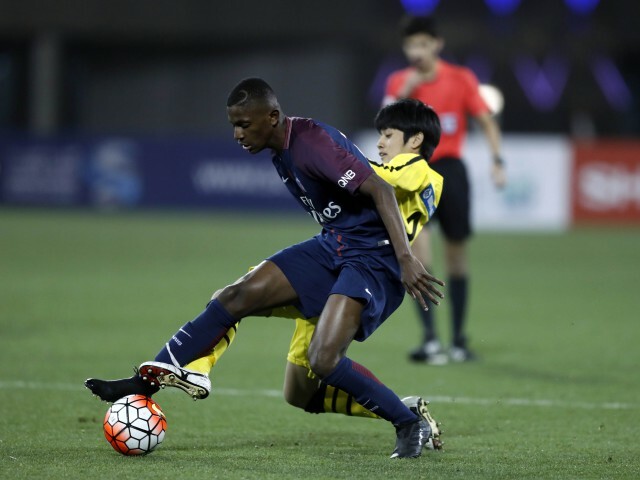 In the second half, there was nothing that Kashiwa could do, when Paris Saint-Germain was battling at the forefront to get their opening goal. It was a fabulous strike from Kapo, and it went straight through the legs of the goalkeeper. After Kashiwa equalized, it looked as if it was going to end as a draw. Fujimoto was playing some good football in the last few minutes. There was some good pressure rising from both teams. Paris Saint-Germain made some final changes, just to get some fresh legs in the last minute.